For scientists attempting to understand how reef ecosystems function, like this one in Palau, they must determine how photosynthetic rates respond to a variety of environmental stressors, including temperature, light availability, carbon dioxide levels, and nutrient availability. 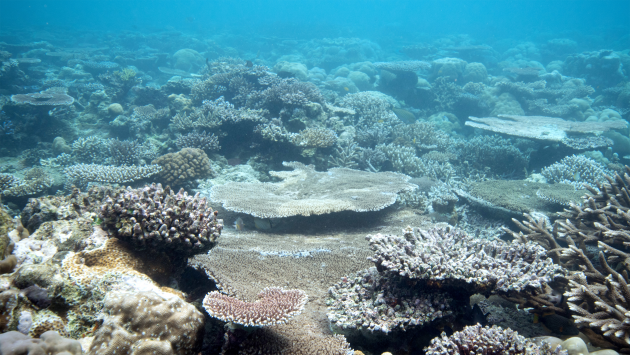 A recent study published in the journal PLoSOne demonstrates that reefs, like terrestrial forests, can optimize their rates of photosynthesis to prevailing environmental conditions. Hochberg pointed out that terrestrial scientists have long understood that plants can adjust their photosynthetic pigment levels to best utilize the long-term, prevailing light field. In practice, this means that—although light levels may change significantly on short time scales and in small areas—plants have adapted such that, on average, they don’t absorb more light than they can use. Given that reefs are composed of photosynthetic organisms, it seemed likely that a similar relationship would hold. “These results indicate that reef organisms, including both corals and algae, most likely optimize photosynthesis to the same degree as terrestrial plants, at the scale of a day or longer,” Sawall said. From the standpoint of a reef scientist attempting to understand how reef ecosytems function, these results point to photosynthesis as an “ecological integrator,” meaning that photosynthetic rates respond to all of the stresses facing an organism, including temperature, light availability, carbon dioxide levels, and nutrient availability. In subsequent research, Hochberg and Sawall are exploring the relationship between the color of an organism and its total daily photosynthesis. These two parameters are determined by an organism’s pigment levels, and terrestrial research has demonstrated that photosynthesis can be predicted by measurement of color expressed by the pigments. This means that a remote sensing system, such as Hochberg’s COral Reef Airborne Laboratory (CORAL) project, has the potential to directly estimate ecosystem primary production without the need for laborious in situ water chemistry measurements. Primary production is one of the metrics that scientists use to measure reef health and ecosystem function. Accurate estimates of primary production are particularly important in determining how reefs around the world are being impacted by global climate change.